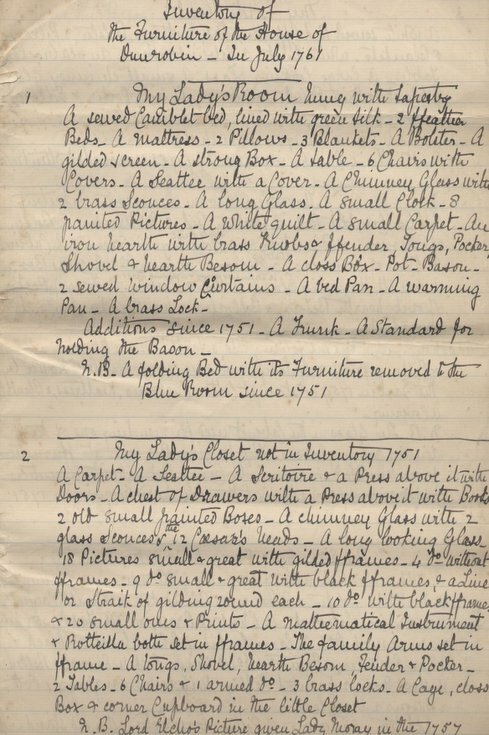 Transcript by Miss Lyon, of Inventory of the Furniture of the House of Dunrobin in July 1761. Rooms listed are My Lady's Room, My Lady's Closet, My Lord's Closet, The Blue Room. The Stairhead Room, The Dineing Room, The Lobby, The Drawing Room, The Red Room, The New Nursery Wing, The Old Nursery, The Colledge Wing, The Factor's Room, Mr Bruce's Room, My Lord's Man's Room, The Armoury, The Lads Room, The Butler's Room, My Lady's Woman's Room, The Garret Room, The Kitchen, Will Ross' Room, The Feather Room, The Stair Case and Passage, The Lasses' Room, The Ladener, The Servants' Hall. The Porter's Lodge, The Pantry, The Brew House, The Milk House, The Washing House, The Stable, The Charter Room, The Library, The Turret, The Ale Cellar, The Wine Cellar. Separate lists of The Silver Plate, The China and The Glasses. Eight sheets, originally on folded paper but outer ones becoming detached.